Submitted on 2012/10/18 at 10:29 am: I LOVE quinoa brownies and pancakes. Theyre a nice protein balance to these carb and sugar heavy dishes. CONTEST IS NOW CLOSED. This recipe title sounds a little odd I realize, but I promise you it will be worth the baking effort. These brownies are moist, sweet yet tart and fulfilling -- everything you want a brownie to be (yes "tart"... really!). I created them on Sunday evening with inspiration from the new cookbook Quinoa Revolution. They ended up being my dessert and my breakfast the next day -- brownie at breakfast? Heck yes, with some greek yogurt! Now they are an indulgence, so keep in mind I'm not suggesting you eat these for breakfast day after day. So the original recipe is called "Black Forest Goat Cheese Brownies", but since I didn't have any dried whole cherries I had to improvise. Also, I made a few joyous tweaks to it. If you don't win the book and you want the original recipe, then I suggest you buy the book. Believe me, you will be glad you did. Preheat oven to 325F degrees. Grease a 9-inch (2 L) square bake pan and line it with parchment. In a small saucepan on medium low heat melt the chocolate chips and butter (or coconut oil), stirring until smooth. Set aside to cool. Place the cranberries in a small bowl with water for 10 minutes to let them hydrate. Drain cranberries. Beat the sugar, eggs, vanilla in a medium bowl until combined. Beat in the melted chocolate mixture. Mix in the flour until just blended, then mix in the almond milk. Pour half the brownie into your greased pan. Top with crumbled goat cheese and cranberries. Pour remaining mixture on top and spread evenly. Bake for 30 minutes or until the centre of the brownie springs back. Do not overbake. Side note: I baked it for almost 40 minutes -- maybe my oven was slow. Cool in pan and chill before cutting into squares. Makes 25 deeeelicious squares! Chia sub: Mix 2 tbsp chia + 8 tbsp water. Let sit for 5 minutes and then combine into recipe. 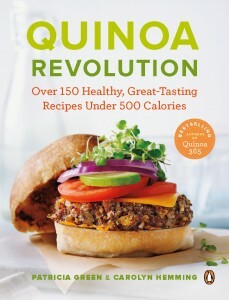 Now if you want to win this amazing book, you can enter below by telling me what your favourite way to use quinoa is?!? Do you love it as a energizing breakfast bowl or do you mix it into a smoothie. Perhaps you just like it with some fresh herbs or mixed veggies. Now if you are a quinoa virgin, then that's okay too -- just let me know in the comments section and consider that your entry. We will randomly draw one person's name next Monday October 22nd. Contest is open to Canada and the U.S.A. residents only. I'm allergic to oats so I love using quinoa flakes to crust my chicken, quinoa granola for yogurt and of course my quick and easy one-bowl quinoa flake muffins! My favorite way to use quinoa is the way that you, Joy, first taught me how to properly enjoy it. That lentil quinoa loaf is amazing; and your kale, sweet potato, quinoa bowl is also another one of my favorite ways to enjoy and use quinoa. Oh man! It is hard to decide my favourite use for quinoa. I really like using it in baked goods, do enjoy quinoa apple breakfast bowls, and as of late have been making quinoa salads with beans, basil and sun-dried tomatoes with some veggies mixed in. I just love its versatility! Those look absolutely amazing! I just wish there were more quinoa (sweet) baking recipes that didn't require the use of quinoa flakes. I personally like eating it "as is", or as a base in quinoa burgers. There's a sweet potato quinoa burger recipe from the How Sweet It Is blog that I've made several times and is incredible! I love quinoa in salads. Not only is quinoa a super food, it is super easy to use in so many ways. This book looks amazing! I have to admit that I love quinoa plain. It has such a great nutty flavour and my kids like it this way too! It's a little messy for them to eat (as some of it always ends up on the floor), but it dries quickly so is easy to sweep up afterwards. I also often add to salads for some texture and substance. Now I need to experiment some more with baking, etc. and can't wait to make these brownies!! Thanks for the recipe! Like in Alice in Wonderland where they celebrated an UNbirthday, my UNmeatloaf is made with quinoa, wheatberries, barley mixed with onions, celery & mushrooms sauteed in olive oil then turmeric & cumin spice it up, eggs bind it. Eaten hot or cold, slices make tasty and nutritious carb & protein sources as part of meal. I use quinoa as a substitute for breadcrumbs in my chicken parmesan receipe. It works fabulous. Salad! Quinoa adds protein to any collection of veggies! I've spent the summer dreaming up new combinations to pack for my lunch at work. Healthy and filling! I know some brownie fanatics who will love this recipe, thanks for sharing! For me quinoa is my ultimate staple. I prepare a large batch Sunday night to be used throughout the week. I have it for breakfast with scrabled egg and avocado; lunches with protein (such as chicken or chick peas), fresh veggies, chopped basil, EVOO and apple cider vinegar; and dinners as a substitute for pasta or rice with spaghetti sauce and stir fry. So versatile, so easy! Huge quinoa fan. I enjoy making a quinoa salad with green onions, avocado and whatever veggies are on hand, drizzled with olive oil. I like substituting quinoa flakes for oats in baking and in homemade granola. I **heart** quinoa! I've used it as a rice substitute and oatmeal substitute! My fav recipe is quinoa with black beans and cheese stuffed into red peppers. Yum. Quinoa for breakfast is my favourite in the winter. Especially with coconut milk, nuts, fruits and a touch of maple of syrup! So yummy and keeps you going all morning! I love throwing them in salads, I never have a receipe and just use whatever mixture of veggies I have in the kitchen at the time. Always turns out yummy. I'd love to win this book and experiment with some other receipes! I LOVE quinoa- quinoa for breakfast, lunch, dinner.. quinoa in cookies! last night I made a quinoa bowl with red peppers, spinach, arugula pesto and pecans! red quinoa, white quinoa, sprouted quinoa- oh my! I would LOVE LOVE LOVE to add this book to my collection! My daily breakfast includes some quinoa warmed up with some almond milk, topped with chopped banana and frozen blueberries, drizzled with blackstrap molasses, and sprinkled with chia seeds and ground flax. Yum! Thanks to your site and recipes, that's how I got introduced to quinoa. I'm still very green with it and sometimes feel limited as to what I can do with it. This book would probably help me out. Thanks for sharing. I love making "greek-style" quinoa salads in the summer, with cherry tomatoes, cucumber, olives and a bit of feta. This time of year I go for winter squash and lots of herbs. I love quinoa! I use it in salads and have baked it with real maple syrup and EVOO served with greek yogurt. I also like it in your kale, sweet potato, quinoa bowl and apple spice bake recipes, Joy! I love using quinoa in salads and stir frys. I will have to try this recipe! My favourite way to enjoy quinoa is either as an apple quinoa salad or nestled under a serving of home made bulgogi and kimchee on the side! Thank you for the opportunity! I love using quinoa as a sub anywhere rice and/or another grain is used... in soups, with stir-fry, to stuff peppers, indian dishes etc! Also, these brownies look delish! Can't wait to try! Looks good! Have not gotten the hang of quinoa yet. It tastes bitter to me. Does it need washed? Hope I win so I can get this fixed. My first experience with using quinoa in baking was when I made an amazing quinoa pineapple upside down cake. it was full of healthy ingredients, and tasted so much better than anything I could have whipped up with the standard stuff. My favourite adder to any quinoa breakfast bowl or supper dish are apples. I just find they compliment each other so well. Cheers. PS. I'm no longer a "quinoa virgin", and for the amount of times I eat it now, I'm becoming a bit of a "quinoa sl*t" ? I'm just venturing into the land of quinoa but I'm really glad to stumble across your blog. I've seen recipes calling for quinoa flakes and quinoa flour but I have yet to find a good source for that. I love trying new recipes. I love experimenting with quinoa for every meal - but especially for lunch and dinner. I make it with a variety of different ingredients like herbs (mint and basil), with dried fruit (that I dry myself in a healthy way), roasted vegetables and the like. I concoct something new daily! Having it in brownies and desserts is also another good and delicious idea. The key is to rinse it first - which I learned the hard way and also to leave some in the fridge once I make a new batch so that I can mix it with whatever leftovers I'm eating. I'm always looking for more recipes to try and experiment with! I love quinoa! I love to use it for dinner because, like you said it is a healthy "fast food". I put it in everything, salads, tacos, soups, you name it! Friends are always asking me for recipes, and I find myself saying "just cook quinoa, add the veggies in your fridge and some healthy oil and/or vinegar and toss!" often. A newly discovered food for me! Love it in a salad or mixed with pecans and dried cranberries with some evoo! Would love to learn more about how to use this healthy food!! Glad I looked you up on twitter. Now I don't have to wait to try these with your joyous spin. I can make them today! I love making quinoa burritos! Quinoa, black beans, some squash and another vegetable and spices!!! Soooo tasty and filling. VIRGIN!! Yes, keep hearing all about it, I sure need some help with a recipe book! If I don't win this one, I'll be buying it for sure! We love using quinoa in our vegan burgers. It is a great addition to the beans. Am looking forward to trying this recipe--thanks for sharing it, Joy! I have recently started using quinoa when I make sushi. It's a delicious alternative to rice and I find it a lot easier to work. This is where I found the recipe: http://mynewroots.blogspot.ca/2012/03/quinoa-spring-sushi-diy-quick-pickled.html P.S. I can't wait to make these amazing looking brownies! I love using quinoa in so many different ways:) it is just so nutritious and delicious and extremely versatile. The best recipe Ive made recently was some quinoa and black bean stuffed peppers :) amazing! I love using quinoa in salads and veggie burgers! I LOVE quinoa brownies and pancakes. They're a nice protein balance to these carb and sugar heavy dishes. I have used quinoa in a number of ways, breakfast cereal, side dish, flour for baking, but my absolute favourite way to eat quinoa is mixed into a salad. The best one is 'Market Fresh Quinoa Bowl' from your blog. My kids ask for it almost daily. First time they've asked for MORE quinoa! You said it best Joy, quinoa is the healthy fast food! I love to serve it with vegan chilli, in burgers or as an accompaniment to any stew or salad. I always make a large pot of quinoa and keep it in the fridge. That way, I have it on hand for breakfast with fruit and almond milk, lunch with my salad, or supper in my veggie patties- the choices are endless! I love quinoa in salads, especially with black beans & cilantro. I also love the lemon blueberry quinoa muffins from the Quinoa 365 superfood cookbook - they are a hit with the whole family! Those brownies look absolutely divine! I have a package of goat cheese in my fridge that has this recipe's name on it. Can't wait to try this on the weekend! My favourite way to use quinoa is as a flour substitute in my baking and pancakes. It's a way to get an extra punch of gluten-free nutrition and I find its texture in baking is kinder on the palate than brown rice flour which I tend to find chalky and dry. I love using quinoa by mixing it with veggies - either fresh or cooked - with olive oil and spices. So delicious! Definitely need to try these brownies.. Mmmmmm. I love using quinoa in my energy bars and as a rice substitute in a stirfry, that way I can leave out the meat if I want. I like using quinoa instead of rice! I also like to use it to make a breakfast bake. Cookies! I actually bought Quinoa cookies the other day! I'm not much of a baker, so I buy my cookies. they were REALLY good! Being celiac, I am always looking for new ways to use quinoa in my meals. My go-to favourite is as a salad with peppers, black beans, tomato, cilantro, garlic & a splash of olive oil. Oh, and feta crumbled on top! Yum! I love quinoa! My favourite way to eat it is on a salad with avocado and eggs. Quinoa is my grain (or grain substitute I should say..) of choice, so I have it alongside chilli and soup all the time. I love to mix quinoa with lots of raw veggies, and an olive oil dressing and take it for my lunch! So delicious! I mix quinoa with chopped veggies, along with hemp seeds, sunflower seeds and some Evoo and lemon juice as a delicious salad. I also cook it as a substitute for rice and I use quinoa flour when making my homemade protein bars. I also like quinoa mixed with steel cut oats. 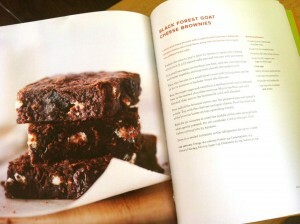 Will definitely try the brownie recipe and would love the recipe book!! I make my own version of Whole Foods' Black Bean Quinoa with extra veggies and avo... soooo yum! My favourite way to have quinoa is with fresh fruit, cinnamon and a little maple syrup. Soo good and satisfies the sweet tooth. I enjoy quinoa over a bed of spinach, mixed with crumbled goat cheese and strawberries. I got on the quinoa kick from your website - i love it for breakfast with almond milk and maple syrup. Also for lunch/dinner in loafs, burgers or veggie stir frys...its so versatile!!! My new favourite way to use quinoa is to batch-cook a bunch ahead of time and use some mixed with cinnamon, nutmeg, cloves, ginger and hemp seeds as an alternative to granola in baked apples for desserts! I like my quinoa in a salad with veggies and maybe some dried fruit and/or nuts. It's also good for breakfast. I dont even mind it plain for breakfast. i love to make quinoa frittatas and often use quinoa as a base for cold salads as well! Quinoa was one of the first grains I tried when I cut out the wheat! I am still amazed by this nutrient powerhouse and I try to include it in most of my cooking as a carbohydrate and protein source, my favourite way too enjoy quinoa is by cooking it in almond milk with stevia, cinnamon and a sliced apple its good in the morning or as a post workout treat! Its easy too make and it never disappoints! Whenever there's a family function.. I always bring the quinoa! Foreign to some but should be known by all! I love cooking quinoa with kale and topping with an egg and green onion. That or Mexican style with lots of lime, cumin, black beans, red peppers, avocado, corn, etc.